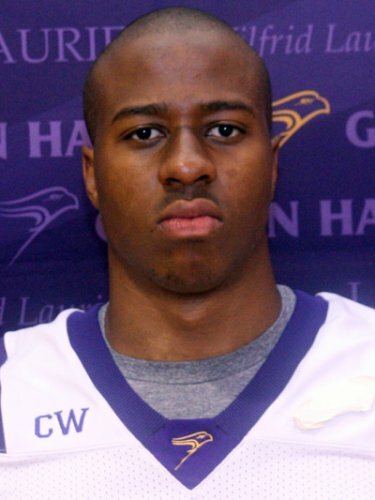 Kent Ridley recently attended E-Camp in Toronto and was kind enough to send us a couple of interviews from top prospects Taurean Allen and Chima Ihekwoaba of the Wilfrid Laurier Golden Hawks. Kent is a guest writer here at BCLionsDen.ca and is owns and operates Ridley Scouting Services which is based in Alberta. 1. When did you start playing football? A: I started out playing football in my Grade 10 year of high school. My school didn’t have a team my grade 9 year so I had to settle for playing volleyball that fall semester which was a blast I might add. 2. How did you end up at Laurier? A: After an extensive recruiting process I chose Laurier because they had everything I desired in a University and football program. Those criteria’s were a small community, a winning tradition, and an excellent academic reputation within the job force. Also helped that #5 was available! 3. What do you prefer to play – CB or S? A: I would have to say CB. I feel I possess all the required tools (speed/instincts/aggression) which has made me a dominant CB in college and ultimately with some fine tuning, pro coaching and continued hard work, the same results should be actualized at the CFL level. A: My favorite highlight hands down would be my diving interception against McMaster in our ’08 campaign. They stayed away from me the entire game and when they finally threw my way it looked like it was going to be overthrown, but I turned on the jets, dove, and hung on for dear life. I got up and started to pump up our fans which made that moment that much better. 5. Biggest achievement in football so far? A: My biggest achievement in football thus far would be everything that has led me to this point in my football career. All the individual recognition and awards that I have garnered along with the three football championship teams I have played on has allowed me to stay hungry and keep driving to be the best, which has led me to where I am at today. 6. What do you expect to bring to a CFL team? A: If I do have the privilege of being drafted into the CFL, I expect to bring my versatility, child like passion and superior knowledge of the game to the table. My athletic ability and overall football skills is a product of nature (god given) and nurture (hard work), but it is my passion and knowledge of the game that I feel will help me the most in my transition from college ball to the pros. 7. Any advice for the 2011 Draft Class now that you’ve been through the E-Camp? A: My advice to the guys who are privileged enough to go through this process next year would be to make the necessary sacrifices. Whatever sacrifices that may be to ensure that each individual is at the peak of their game and athleticism is within each man. A wise man once said, ‘In the game of football there are only 2 types of pain: That of hard work and the pain of regret.’ The choice is yours! A: I started playing football in the 10th Grade at Notre Dame Secondary School Burlington Ontario. Played Defensive end, Defensive Tackle, Line Backer and Fullback, through my high school years. A: I committed after visiting the school a few times. I knew that Laurier’s defensive system would be a great fit for me. 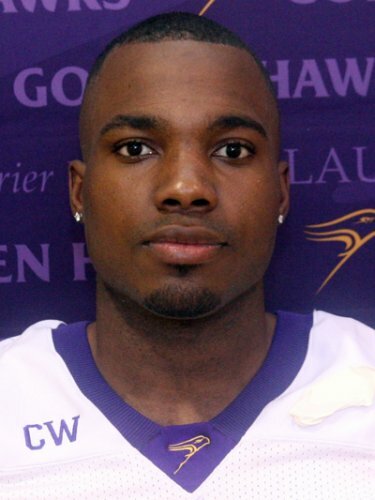 Laurier’s system relies on athletic defenders across the board. Also in my prior to my freshman year I knew that there would be many 3 veteran defensive ends in their final years, so I knew prior to coming to Laurier I could learn a lot from these guys and my coaching to develop me into the player I’ve become. 3. What do you prefer to play – DE or DT? A: My first sack in my freshman year in my first series of play in CIS football against University of Toronto. A: The honour of being invited to the CFL evaluation camp. It sums up all the hard work I’ve put in thus far and my dedication to the game. A: A competitive hard worker, who is dedicated and loves the game of football. Also, a versatile and athletic football player who comes from a very intricate defensive system. I physically dominate offensive linemen with my strength and speed play after play. I take my pride in my “will to win” every down. Very good footwork and technique, again a versatile D-lineman who can rush from a four down line or up as a rush at the same time. Calm and collective off the field, but when the pads are on its all business. A: Start training now. The next year dictates your future in football, work to be the best every day. Keep in mind there’s someone out there trying to take your spot. The people that don’t believe in you is your motivation, prove them wrong. Eat or be eaten.